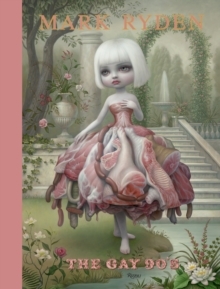 Celebrated Pop Surrealist artist Mark Ryden's newest body of work, presented in this book for the first time. Crowned "the high prince of Lowbrow," Mark Ryden has become a fixture of the contemporary alternative art movement. In his newest work, Mark Ryden: The Gay 90's, the artist casts his skewed perspective toward the turn of the nineteenth century with such creepy yet beautiful works as a portrait of Abraham Lincoln dressed in foppish 1890s fashion and surrounded with a heavenly nimbus, Jesus Christ playing a pink piano for an audience of kewpie triplet girls, and a Gibson girl in a tight corset constructed entirely of meat. With masterful painting technique and disquieting content, Ryden's newest paintings display his fascination with the earnest kitsch found in popular art of the end of the 1800s, yet reinforces how his paintings now more than ever are a skewering of both historical and current pop cultural touchstones. Ryden's visual cues range from cryptic to cute, balancing his compositions between nostalgic clich and disturbing archetype. This book showcases his talent for creating paintings that marry accessibility and technique with visceral resonance and sociocultural relevance, making it easy to see why he garners the ardent attention of museums, critics, and serious collectors alike.